Description: On March 8, 1862, from her berth at Norfolk, the Confederate ironclad Virginia (formerly Merrimack) steamed into Hampton Roads where she sank Cumberland and ran Congress aground. On March 9, the Union ironclad Monitor, having fortuitously arrived to do battle, initiated the first engagement of ironclads in history. The two ships fought each other to a standstill, but Virginia retired. Significance: The Battle of Hampton Roads, often referred to as the Battle of Monitor and Merrimack (often misspelled or misidentified as the Merrimac, which was a different vessel), and the Battle of the Ironclads, was the most noted and arguably the most important naval battle of the American Civil War from the standpoint of the development of navies. It was fought over two days, 8–9 March 1862, in Hampton Roads, Virginia, and it rendered every single navy in the world obsolete. 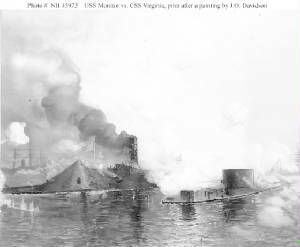 Numerous well documented first-hand accounts, from Union and Confederate seamen and officials to civilians and onlookers, have assisted greatly in preserving the world's first ironclad duel: Battle of Hampton Roads: Official Reports and USS Monitor Versus CSS Virginia (aka Monitor - Merrimack Battle). Who Won the Battle of Hampton Roads? 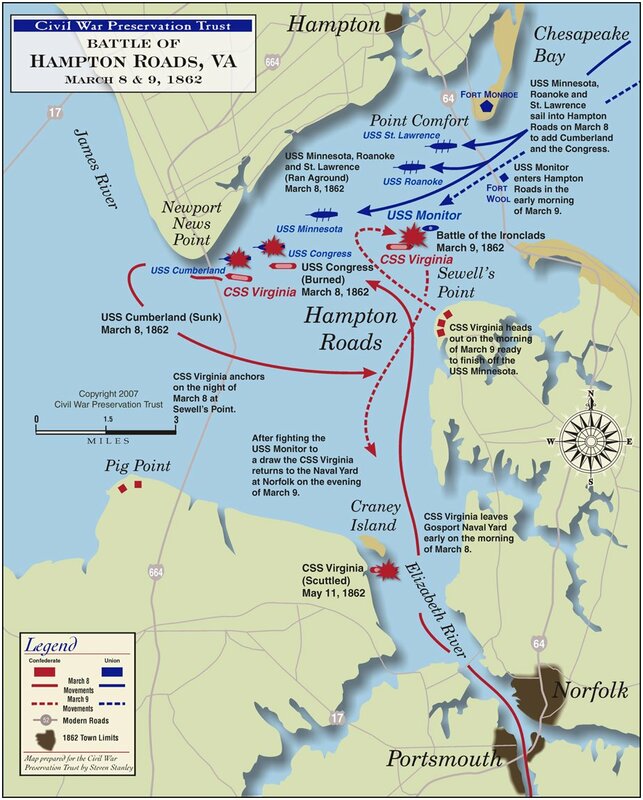 The victory claims that were made by each side in the immediate aftermath of the Battle of Hampton Roads, based as both were on misinterpretations of the opponent's behavior, have been dismissed by present-day historians. They agree that the result of the Monitor-Merrimack encounter was victory for neither. As the combat between ironclads was the primary significance of the battle, the general verdict is that the overall result was a draw. All would acknowledge that the Southern fleet inflicted far more damage than it received, which would ordinarily imply that they had gained a tactical victory. Compared to other Civil War battles, the loss of men and ships for the Union Navy would be considered a clear defeat. On the other hand, the blockade was not seriously threatened, so the entire battle can be regarded as an assault that ultimately failed. Both days of the battle attracted attention from all the world's navies. USS Monitor became the prototype for the monitor warship type. Many more were built, including river monitors, and they played key roles in Civil War battles on the Mississippi and James rivers. The US immediately started the construction of ten more monitors based on Ericsson's original larger plan, known as the Passaic-class monitors. However, while the design proved exceptionally well-suited for river combat, the low profile and heavy turret caused poor seaworthiness in rough waters. Russia, in fear of being drawn into the American Civil War, launched ten sister ships, as soon as Ericsson's plans reached St. Petersburg. What followed has been described as "Monitor mania". The revolving turret later inspired similar designs for future warships, which eventually became the modern battleship. The vulnerability of wooden hulls to armored ships was noted particularly in Britain and France, where the wisdom of the planned conversion of the battle fleet to armor was given a powerful demonstration. Another feature that was emulated was not so successful. Impressed by the ease with which the Virginia had sunk the Cumberland, naval architects began to incorporate rams into their hull designs. The first purpose-built ram in the modern era was the French armored ram Taureau (1863), whose guns were said to have "the sole function of preparing the way for the ram." The inclusion of rams in warship hull design persisted almost to the outbreak of World War I, despite improvements in naval gunnery that quickly made close action between warships almost suicidal, if not impossible. 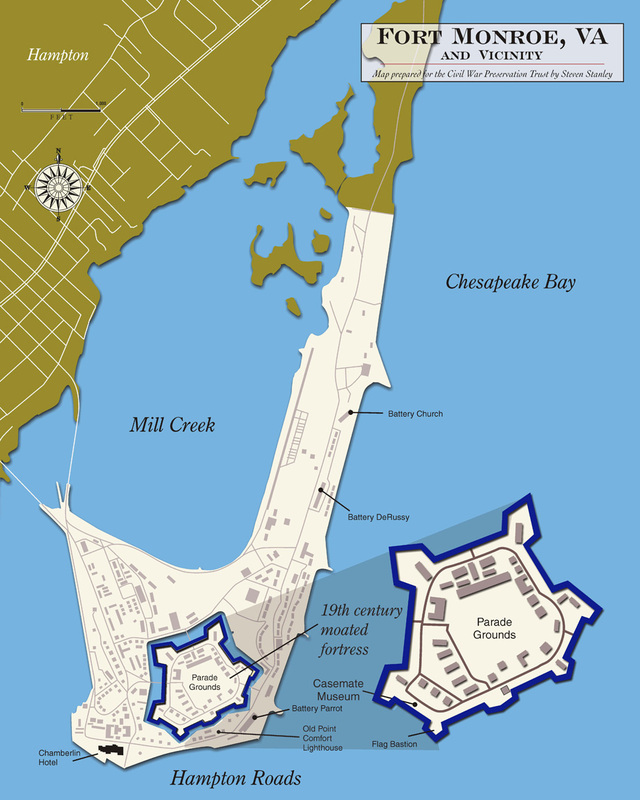 See also: Battle of Hampton Roads: A Civil War History. Sources: National Park Service; US Navy, Washington; Anderson, Bern (1962). By sea and by river: the naval history of the Civil War. Knopf; reprint, Da Capo, n.d.. ISBN 0-306-80367-4; Browning, Robert M. Jr. (1993). From Cape Charles to Cape Fear: the North Atlantic Blockading Squadron during the Civil War. University of Alabama. ISBN 0-8173-5019-5; Davis, William C. (1975). Duel between the first ironclads. Doubleday, Durkin, Joseph T. (1954). Stephen R. Mallory: Confederate Navy chief. University of North Carolina; reprint, University of South Carolina, 1987. ISBN 0-87249-518-3; Gibbons, Tony (1983). The complete encyclopedia of battleships: a technical directory of capital ships from 1860 to the present day. Salamander Books. ISBN 0-517-378108; Luraghi, Raimondo (1996). A history of the Confederate Navy. Annapolis, Md. : Naval Institute Press. ISBN 1-55750-527-6: (translation by Paolo E. Coletta of Marina del Sud: storia della marina confederate nella Guerra Civile Americana, 1861-1865. Rizzoli, 1993. ); Musicant, Ivan (1995). 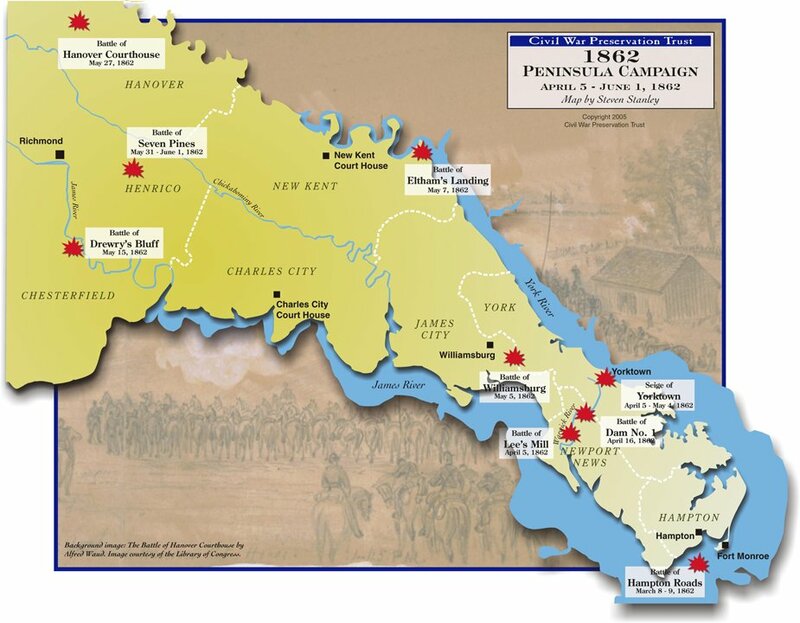 Divided waters: the naval history of the Civil War. HarperCollins. ISBN 0-06-016482-4; Scharf, J. Thomas (1887; reprint, Random House, 1996.). History of the Confederate States Navy from its organization to the surrender of its last vessel; its stupendous struggle with the great Navy of the United States, the engagements fought in the rivers and harbors of the South and upon the high seas, blockade-running, first use of iron-clads and torpedoes, and privateer history. New York: Rogers & Sherwood; Simson, Jay W. (2001). Naval strategies of the Civil War: Confederate innovations and Federal opportunism. Nashville: Cumberland House. ISBN 1581821956; Still, William N. Jr. (1985). Iron afloat: the story of the Confederate armorclads. Vanderbilt University. ISBN 0-87249-616-3; Tucker, Spencer (2006). Blue & gray navies: the Civil War afloat. Annapolis: Naval Institute Press. ISBN 1591148820; United States Department of the Navy, Naval History Department (1971). Civil War naval chronology, 1861–1865. Government Printing Office; Wise, Stephen R. (1988). Lifeline of the Confederacy: blockade running during the Civil War. University of South Carolina. ISBN 0-87249-554; Civil War Preservation Trust.